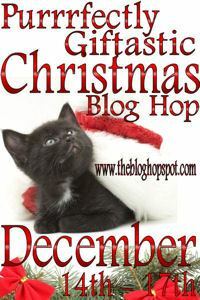 I fell down on doing what I was supposed to do–participate in the The Blog Hop Spot’s Purrfectly Giftastic Christmas . This is very unlike me. I am so very, very sorry. I could blame my oversight on so many things. Let me name them. A bevy of house repairs has been inundating me lately. Money, money, money and attention out the door. I am on the side of the Grinch. The holidays aren’t my thing, so I tend to put them off to the last moment. That shopper on Christmas Eve? That’s me. Be kind. We have emotional issues about this time of year. My calendar on my computer reverted back to another year, making my days all messed up. Did I mention that I hate this time of year? Putting all that aside, I am still giving away two $10 gift certificates to Amazon.com. Just leave a comment about anything. I can’t be choosy after being so late. So sorry you’re having such a day! I’m a Grinch, too, this year. It seems like most of us are on uneven ground right now. It must be in the air! It can turn around though! We have to take joy when we can! This gives me a lot of joy! I love discovering new authors and blogs! Oh sorry! I hope your days start going better! Thanks for the giveaway! Happy Holidays! Much sympathy! I’m currently procrastinating on all the shopping I need to finish. Sometimes the holidays just get to be too much. I’ve been working long hours at my 2 jobs, and trying to bake cookies, buy and wrap gifts, and decorate in the few hours I’m home and not asleep. I’m on this blog-hop, as well as others, and trying to keep up with promoting my latest book, in addition to squeezing in some time to write. So I really hear ya about no time. And $deficit. Soon it will be boring January again, with long stretches of time with nothing to do. Comfort yourself with that. And there’s always rum in the eggnog to put you into the holiday spirit! Wink! Fiona, that truly helps. Thanks. I hope things get better for you , and Happy Holidays! Sorry you’re having tough times 😦 I hope things get better for you!! I’ve been saying bah hum bug a lot! Merry Christmas! Thanks so much for participating in the hop! Hey! Thanks for the Hop and Happy Holidays!! !